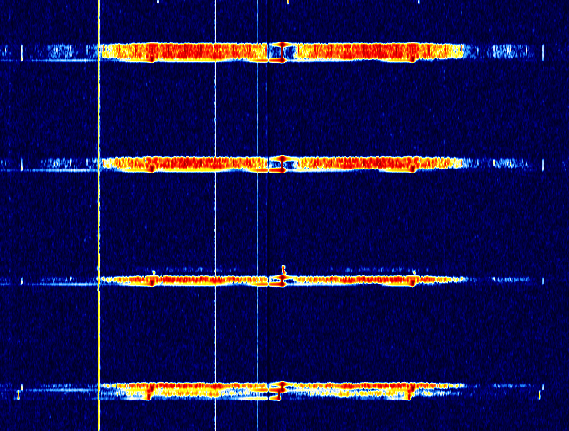 Visual SDR tools are always good for finding signals and monitoring RF spectrum. Here, we can use SDRSharp to view ACARS signals and calibrate the RTL dongle. Since most of them use cheap crystals that do not work on exactly 28.8 MHz, some frequency correction is needed. 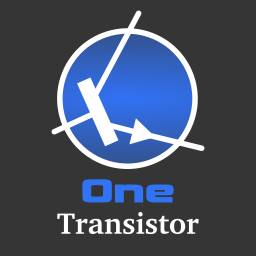 For Europe and USA you need to RTL dongles to cover all frequencies, while for the other regions one is enough since all frequencies are within the 2.4 MHz bandwidth of RTL SDR. You should be able to receive ACARS even with an ordinary FM band whip antenna. Start SDRSharp and look on one of the ACARS frequencies for your region. 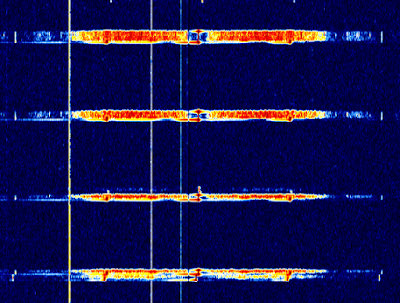 You should see signal bursts of no more than 10 kHz width. You will not receive signals on all of the above frequencies. If you get signals on frequencies very near to the channel assignments, this means your dongle needs frequency correction. While SDR is playing, click the Configure Source button and adjust Frequency correction (ppm) value until ACARS signals fit on the correct channel frequency. 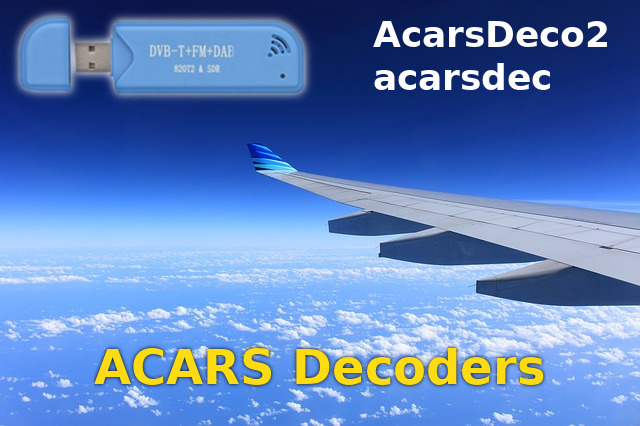 Write down all frequencies on which you received ACARS signals and also the ppm value for frequency correction. Close SDRSharp. This is the first software. It is a command line tool which controls the RTL SDR and outputs data in many ways. 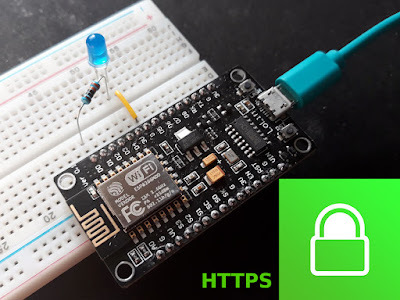 It creates a web server that can be accessed at http://localhost:8080, but it can send data over network to other tools, like COAA PlanePlotter. select a device with --device-index or --device-serial. set tuner gain with --gain and frequency correction with --freq-correction. add frequencies to receive with --freq arguments (one for each frequency). set web server port with --http-port. send data to PlanePlotter via UDP using --outConnectUdp pp:127.0.0.1:9742. The address and port should match those set in PlanePlotter as you will see later. This one is offered as source code and compiles on Linux. It has similar capabilities, like multiple frequencies and PlanePlotter data output. The utility is developed by Thierry Leconte and its source can be downloaded from GitHub. To compile it, you need some development tools and libraries. Here are all the commands you need to have acarsdec installed. 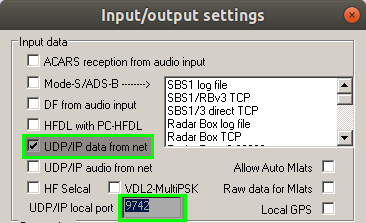 send data over UDP in PlanePlotter format with -n 127.0.0.1:9742.
set gain to 48 dB with -g 480. Without this argument, AGC is enabled. set frequency correction with -p 30. Adjust value for your dongle if needed. select device and channels with -r 1 131.725 131.825. The first number after -r is the device index. After this, you can set up to 8 frequencies in MHz. Unfortunately, acarsdec does not feature a web server. Still, it has network capabilities, being able to send data over network to PlanePlotter or other applications in JSON format. I run both tools with 131.725 MHz and 131.825 MHz frequencies, assigned to primary European channel and additional European channel, respectively. Adjust the argument with the frequencies you get signals on. PlanePlotter is shareware software developed by COAA (with 20 days trial). It can process ACARS, ADS-B and HFDL signals. It supports also audio piping, but for the tools presented above, network is the preferred medium. Both AcarsDeco2 and acarsdec are run with arguments that enable sending ACARS messages over UDP. PlanePlotter is Windows only software. However it runs without issues in Wine. The screenshot below is made in Linux Ubuntu. On the first run, you are prompted to enter your location coordinates. If you closed that dialog, you can find it in Options - Home location - Home location setup. UDP is configured in Options - I/O settings by checking UDP/IP data from net and setting local port to 9742 (or whatever you passed as argument to AcarsDeco2 or acarsdec). If you have the ACARS decoder running, you can start PlanePlotter by clicking the green button on the toolbar. If the IP address to which one of the decoders is sending messages matches the computer that runs PlanePlotter (and no firewall is blocking traffic), you should see live data. Wikipedia contributors. "ACARS." Wikipedia, The Free Encyclopedia. Wikipedia, The Free Encyclopedia, 3 Apr. 2018. Web. 13 Apr. 2018. Utility DXers Forum. List of HFDL / ACARS / VDL2 / Mode-S id’s and frequencies (accessed 13 Apr. 2018). acarsd. Known ACARS Frequencies (accessed 13 Apr. 2018).